The 4th September 2000 was a very important day for children's books, and more particularly for boy-friendly fiction. 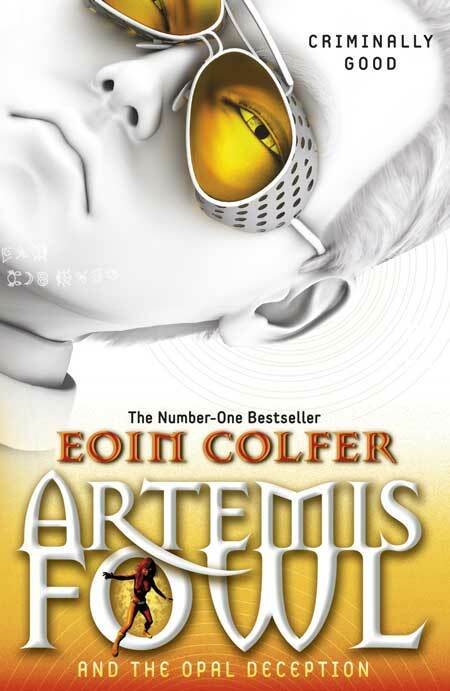 That day saw the publication of Stormbreaker, the very first outing for Alex Rider, Anthony Horowitz's reluctant teen spy, and now more than a decade later the ninth and final book of the series is released today. I personally believe that the impact that this series has had on children's publishing is immeasurable, not only due to its own success, but also the plethora of similarly themed stories that have been published (and continue to be published) since. I personally know many boys who have been turned on to reading by the Alex Rider series, and I am sure that teachers and librarians around the country have had very similar experiences. 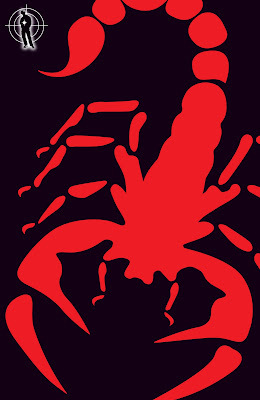 Today sees the release of Scorpia Rising, the final book in the series (read the first chapter here), and it really doesn't seem like ten years since we were introduced to Alex, yet even though a decade has passed for us, the time period covered by the series is much shorter - not much more than a year, in fact. In Scorpia Rising Alex is now 15, and he hasn't heard from MI6 in five months, giving him the opportunity to settle into the life a normal teenager should be living, concentrating on his first year of GCSEs, being made captain of the school football team, and even finding himself being given the part of Teen Angel in the school's production of Grease. With every silver lining, there is usually some kind of dark cloud in tow - in this case Alex's long time carer and closest friend, Jack Starbright is getting itchy feet. She rarely sees Alex any more as he has now managed to build a healthy social life with friends his own age, she questions whether he needs her any more, and there is some pressure for her to return to the USA where her father is quite ill. Anthony Horowitz has made it very clear that this will be the final Alex Rider book, and this starts to become quite clear as we read these early scenes between Alex and Jack - time and events have changed them both and now it is possibly time to move on. I say 'early scenes', but this is a little misleading - we don't actually get to read any kind of scene featuring Alex until page 129! Sounds a little crazy that we don't get to see our hero until almost a third of the book has past, but therein I feel lies the cleverness in Mr Horowitz's writing, and also helps make this book the best in the series so far. Those first 128 pages are devoted entirely to Alex's enemies, following them as they devise a scheme that will net Scorpia a fortune, whilst at the same time enabling them to destroy the teenage boy that has been a thorn in their side for so long. In order to assist them in their dastardly plan they enlist the help of another of Alex's enemies, a character we first met much earlier in the series - and no, I'm not going to say who it is, or even which book it was in, as that would just spoil the surprise for you. All I will say is that this person hates Alex more than life itself and will do everything within his/her power to destroy him. By devoting this much time to the set-up, Mr Horowitz created in me an ever-growing nervous tension, as I started to wonder just how Alex would survive this final mission. This tension was heightened by the fact that Mr Horowitz had previously stated that a character that had been in all of the previous eight books would die in Scorpia Rising. A little knowledge can be very painful - every time a key character seemed in jeopardy I found my heart beginning to race, fearing that this would be the moment I had to say goodbye to an old friend..... and then somehow that person would survive, my heart rate would return to normal, only to accelerate again a little later. The author does this to us several times, making the scene where a character dies even more hard-hitting, and also very much emotional. I read a large portion of Scorpia Rising whilst on a train heading into London to listen to Mr Horowitz give a lecture for the National Literacy Trust, and as I read this scene I am not ashamed to admit that I had tears in my eyes. I very much doubt that I will be the only Alex Rider fan who sheds a tear at this point in the story. I told Mr Horowitz as much when I had the chance to talk to him, and I got the impression that he had found it an emotional scene to write. As well as the changing relationship between Alex and Jack, there are many other elements throughout Scorpia Rising that indicate that this will be the concluding episode of the series, long before we get to the final chapters. Before Alex even appears in the book we are told that Alan Blunt will soon no loner be in his senior MI6 position. Somewhat topically, a new prime minister is in power and has decided to shake up the intelligence services, and his discovery that MI6 has been using a teenager on missions was the final nail in Blunt's professional coffin. However, with the end of his career in sight will Blunt worry about the consequences of using Alex one more time or will he finally see sense? Can he possibly stoop any lower than has has before? Another popular MI6 character throughout the series has been the jocular gadget inventor, Smithers. Yet again he is able to lend Alex a hand with a useful 'toy' when he finds himself having to go to Cairo, and for the first time in the series we actually get to see a little more of Smithers as he goes out into the 'field'. This leads on to an incredible revelation about the portly technical wizard, and also the unveiling of his greatest ever invention. We have seen a lot happen to Alex over the course of the series, and he has matured faster than any teen of his age should, but in Scorpia Rising we see him have to cope with the violent death of someone he knows, and the gamut of emotions he experiences following this - numbness; pain; anger; hunger for revenge... we really do see his raw emotion and with this comes a fatalism that we haven't witnessed before in Alex. In the past it was all about survival - by the end of this book it seems he doesn't care whether he survives or not! I really do think that this is my favourite book of the whole series - it has all the best elements of the previous eight including the tight plotting, the twists and turns, the great action scenes, totally evil villains.... you name it, Scorpia Rising has it. However, I am sure that there will be fans out there who do not share this opinion. The expectation felt by fans before reading the final book in a popular long-running series is always pretty extreme, and may will have their own ideas of how they want the series to finish. I expect you will read a number of reviews as glowing as mine, and probably an similar number of negative reviews with fans complaining about one issue or another. I would suggest you read the book for yourself and make your own mind up, and whatever your feelings about Scorpia Rising then join me in thanking Anthony Horowitz for the thrills and excitement he has brought us over the past ten years, and will no doubt continue to bring us in the future with the continuation of his fab Power of Five series, and the Alex Rider spin-off book he plans to write, with the story based upon how Yassen Gregorovich became an assassin. Thank you Mr Horowitz! My thanks go to Walker Books and Just So for sending me a copy of the book to review. Scorpia Rising is released today in paperback format only (in these financially difficult time I think this is a great move as the book is priced at only 6.99 meaning that fans don't have to wait a year for a more affordable edition). Don't forget that you can get a taste for the story by reading the first chapter here. These days your average writer can no longer afford to be the shy and retiring mole-man (or woman) who hides away in some darkened room to emerge blinking into the sunlight once a year with another finished book. Oh no...those halcyon days are long gone. An author in this new multimedia world has also to be a one-man (ahem...or woman) marketing and PR machine. More than that, somebody willing to stand on stage and present - or in some cases even, perform - to an audience of hundreds. The book industry in some ways mirrors the record industry. Before there were MP3s, a rock band could record an album and spend the rest of the year living off the money of CD sales while they casually dabbled with ideas for their next album. 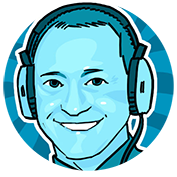 But since the advent of MP3s, bit torrent, ipods and rampant piracy bands can no longer afford that kind of luxury and has to now generate their income from a steady stream of paying gigs. So with the book industry going the way of the record industry and novels now being digital (ebooks) or being discounted and sold at virtually the cost it takes to print them (thanks Big Supermarket and Online retailer who's name reminds me of a South American river) authors are having to do the same to stay afloat. Very, very few of us writer-types earn enough from the sale of books for writing to be our only job. In most cases, we all have a second job. In my case that's visiting schools, promoting reading and talking about TimeRiders as well as the idea of books being, quite honestly, the best entertainment hardware in the history of mankind. (But then I'm biased). I do know a lot of writers who find this part of the job very hard; they're uncomfortable with the idea of standing on stage and pontificating about their craft, being the centre of attention, an' all that. But me? Good grief, I actually love it! I guess it's a result of all those gigs I used to do in various rock bands. There's nothing quite like the buzz of being on stage. But you know it's something I think we all enjoyed once, back when we were little kids. Didn't we all love showing off? Didn't we get a thrill out of everyone's 'coos' and 'ahhhs' at our funny pudgy faces or our first faltering baby-steps? The sad truth is though that either we grow out of it or maybe in this country we're educated from a young age not to express ourselves so wantonly. So we all learn to be shy, quiet, reserved....to not make fools of ourselves. To fear more than ANYTHING that fate worse than death....being embarrassed. It's a quite paralysing fear that most of us Brits seem to suffer from. It stops us daring to sing on a karaoke night, it stops us from saying the things we most yearn to say to our nearest and dearest. It stops us following our dreams. Totally daft, that. Ah well, who cares really, right? I mean I embarrass myself all the time. I love it. It's liberating. So it really hasn't been a problem doing school visits. Hasn't been an issue for me when technical problems have resulted in me having to keep 200 primary school bottoms from fidgeting while the tech-guys fix the problem. Yes, I've resorted to doing my Orangutan and appalling Marge Simpson impersonations, all in the name of promoting books. Sigh. And there was me thinking that being an author was just about the writing. Actually, I'm glad it's more than that. Glad I get a chance to meet and talk to readers. Huge thanks to Alex for taking time out to write this. Many people incorrectly think that authors are huge earners - they read about the likes of JK Rowling and believe that this is the norm. We recently had William Hussey visit school, and when asked how much he earned he informed a shocked audience that the average annual earnings of a children's author in the UK is approximately £7000. School visits are incredibly important: for an author it can help supplement their income so that they can afford to continue devoting time to writing the books we love, and for the pupils it helps create an excitement for books and reading. I have seen this time and time again, and if I had my way we would have authors in every week. I am slightly behind the rest of the world with this one as it was last week that I received the email informing that the cover for Rick Riordan's second Kane Chronicles book had been unveiled. However, I have spent the best part of the last week in bed with a horrible flu thing and I completely forgot about that email. If you have read my review of The Red Pyramid, the first book in the Kane Chronicles series, then you will know that I was a little disappointed with it. 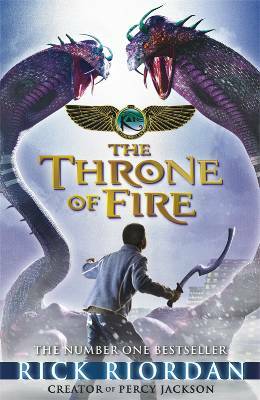 However, I loved The Lost Hero and let's face it - the release of any new Rick Riordan book is something to be excited about so I am determined to keep an open mind when I get the chance to read The Throne of Fire, and rest assured that when I have my review will appear here. Anyway, my apologies for the somewhat belated post about the cover of The Throne of Fire - what do you think of it? 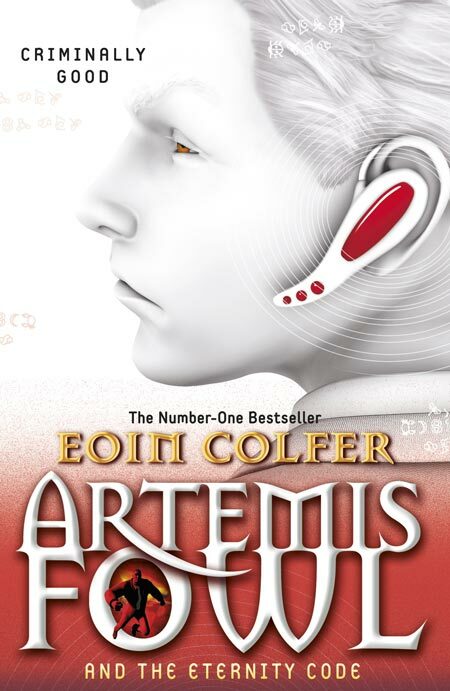 I personally think it is a huge improvement on the cover for The Red Pyramid, and I definitely prefer it over the US cover. The Throne of Fire is scheduled to be released in the UK by Puffin on 3rd May, and if you have not yet read The Red Pyramid then you will be able to get the paperback version that is being published on the same day. For a teaser of what is to come for the Kanes then why not pop on over to www.kanechronicles.co.uk were you can preview the first chapter of the new book. 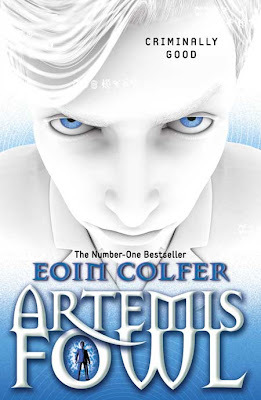 Percy Jackson fans - you will have to wait until October to get your hands on the next (as yet untitled) book in the Heroes of Olympus series. Well done and thank you to all of you who entered. I will now endeavour to contact the winner through by email. Please reply within 48 hours or I will draw another name out of the hat. Many thanks to Sean for providing the prize. 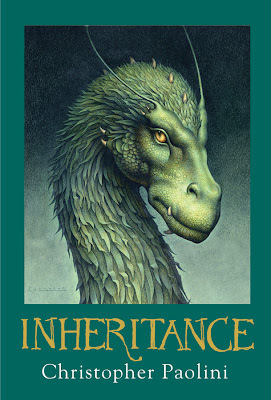 At last...... the news that every fan of Christopher Paolini's Inheritance Cycle books has been waiting for, ever since they devoured the third book in the series, Brisingr back in 2008. 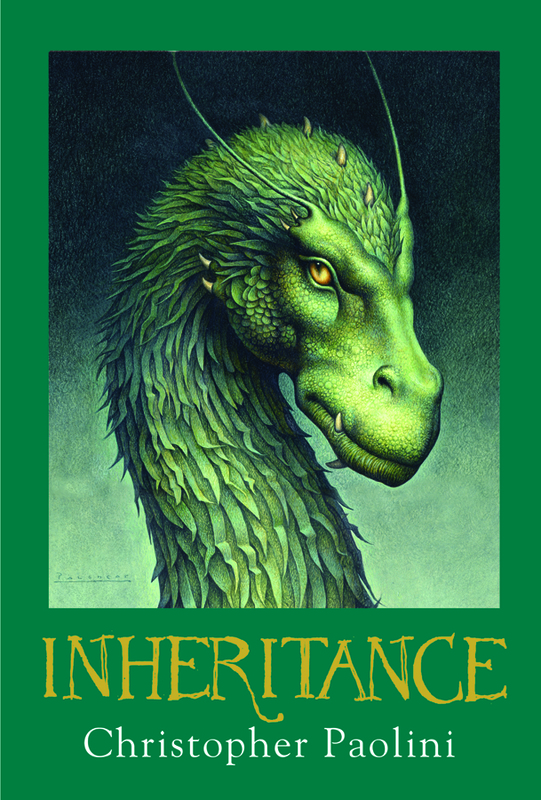 As ever John Jude Palencar has done a stirling job on the cover deisgn, although I personally feel that he peaked with the stunning golden dragon on the cover of Brsingr. 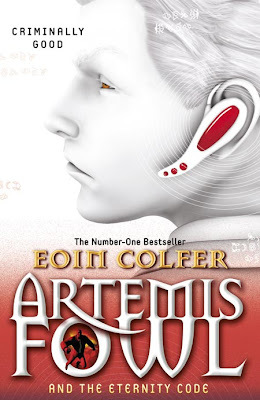 You are probably asking exactly the same question as I did when I first spotted this book: Does the world really need another book series about a teen secret agent? Since Anthony Horowitz's Stormbreaker was unleashed on the world there has been no shortage of books with a similar central character and theme; some of these have been great, some of them not so. Agent 21 is somewhere inbetween the two. The story introduces us to Zak Darke, a teenager who siz months earlier lost both of his parents in what was possibly some kind of mass-murder or terrorist attack in Lagos. He is now living with his aunt, uncle (both resenting his presence) and his cousin Ellie, trying to get through each day, one at time. Everything is as normal as it can be for someone in Zak's situation, until he starts to get the uncomfortable feeling that he is being followed. He suspicions are soon proved all to real when he is approached by a man who claims to have information as to the real reason behind the deaths of Zak's parents, a man who has a proposal for him. Life for Zak will never be the same again. Although the overall concept is not a new one, and as such many books in this genre follow a fairly standard formula, the ensuing plot is well paced and exciting enough to keep even seasoned fans of the genre interested. 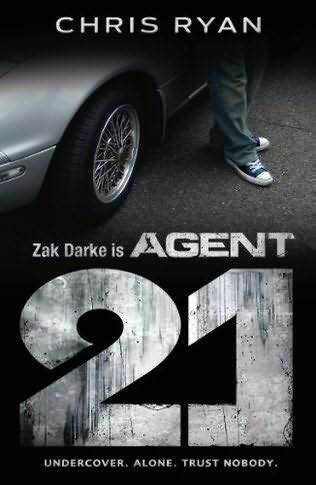 Zak is whisked off to a remote Scottish island for his initial training and introduction to other key members of this covert government department, and then once his preparation is complete it is off to Central America for Zak, with the task of infiltrating the family of Cesar Martinez, Mexico's biggest and most powerful drug lord. So begins a mission that will test Zak's new skills to their limits although as this book is the first in the series it is no spoiler to say that Zak survives the mission. However, he does so in a way that rarely seems improbable (and if you are reading books like this then you have obviously already decided to ignore the improbability of the government using teens as agents), and Chris Ryan makes it easy for us as readers to relate to the emotions he experiences as he risks life and limb for his country. Whilst not the greatest I have read in this genre, as the opener to a new series Agent 21 shows a lot of promise and I will certainly be wanting to read more about Zak Darke in the future. He is an interesting and flawed character, who is very much a teenager, albeit it one with some rather extreme skills now that he has been trained in special-ops. I would like to see more interaction between Zak and some of the other characters in future stories, perhaps with them all involved in a mission together, as they are very much in the background in this story. Agent 21 was published by Red Fox back in January and my thanks go to the generous people at Random House for sending me a copy to review. With less than ten days to go until its official publication date Walker Books have now released the third and final teaser trailer for Anthony Horowitz's Scorpia Rising...... enjoy! Lex Trent is reigning champion of The Games contested between fickle Gods using human playing pieces. He has it all: Fame. Glory. Wealth. An enormous ego. Luck may usually be a lady to Lex...but in the Wild West they play by their own rules...and Lex has never been that good with rules. 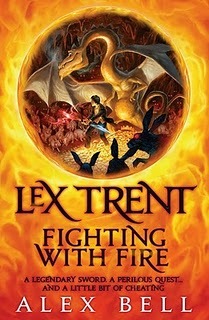 I remember trying to write the review of the first Lex Trent book more than a year ago - I found it a really difficult task for two reasons: firstly, it is a fantasy story, and this is a genre I have often struggled with; and secondly, there was just so much going on that I was a little scared of spoiling any of the many treats awaiting a first time reader. Now, more than twelve months on, I find myself having exactly the same difficulties with its sequel. Lex Trent is back, taking part in another set of games that keep the gods so amused, and he is as obnoxious as ever. In fact, it is partly his arrogance that sees him taking part in the games for the second time - he just can't bear the thought of someone else taking his title off him. Yet again I found myself leaping between totally loathing this main character and excitedly rooting for him. I'm not sure I have ever come across a character like him in all my years of reading. Part of the great appeal of the first book were the characters with whom Alex Bell surrounded Lex Trent during his adventures. This strength in her writing is even more apparent in this sequel, with the creation of two fantastic secondary characters - Jeremiah East, an upper-class twit whose family have a long connection with the Trents, and Jesse Layton, a wisecracking cowboy straight out of the Wild West. Both of these characters are extremely well created and the banter between them and Lex sets us up for many moments of sparkling and hilarious dialogue. Alex Bell's writing almost defies description. At times it feels like Terry Pratchett, but that may just be down to its comedy fantasy leanings, and I have not read a huge amount of the Discworld novels to be able to accurately qualify that statement. Then all of a sudden there will be a scene or line of dialogue that is as close to Monty Python as you are likely to find in modern YA fiction. Alex Bell obviously has a warped and surreal sense of humour, and an imagination to match this. It would not surprise me if Ms Bell often broke down into fits of laughter as she wrote some of the scenes in this book - I was certainly laughing out loud at times. 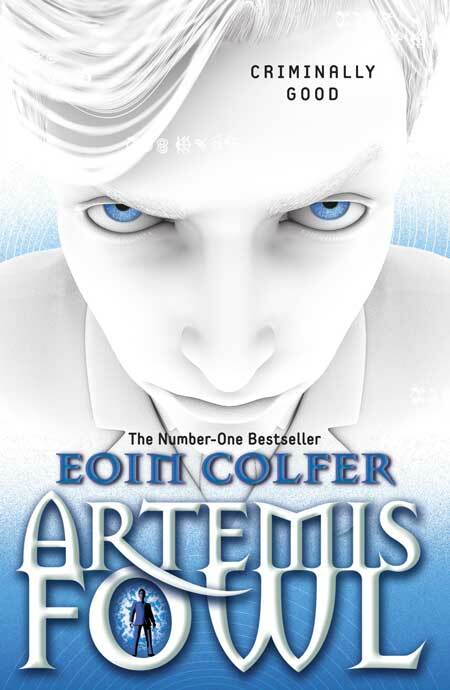 If you enjoyed the first book in the series then you will love this one; in my opinion it is even better than Lex Trent vs The Gods. My thanks go to the generous people at Headline for sending me a copy to review. When Jonas finds a gun left from a shooting he takes it home. He can't wait to show his mates Kamal and Binny, who reckon they can use the gun to bolster their own street cred. But when Kamal starts to use the gun in robberies, Jonas realises it's only a matter of time before someone gets hurt. Author Bali Rai has written a handful of books for Barrington Stoke, the most recent being The Gun. 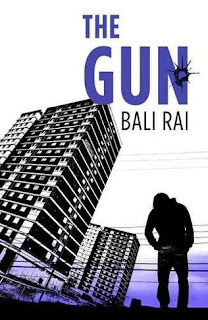 Mr Rai has been slowly building a reputation over the past few years for writing hard-edged dramas, often set in inner city areas, with theme that focus on many of the contemporary issues that face young people living in these areas, and The Gun is no exception to this. It is a simple tale of three friends witnessing a drive-by shooting, one of whom manages to get his hands on the hastily discarded weapon before the police are on the scene. For Jonas it is all something of an adventure to have his hands on a firearm, but with gang culture never far away, and Jonas's friend Kamal deciding that he has big plans for the gun, things soon get out of hand. Kamal is very much a loose cannon, described by Jonas's sister as "....always five seconds away from going crazy", and soon even his friends are unable to control him. Many boys living in inner city areas will be able to relate to the issues within this story. Some will have been tempted into carrying a knife at some point, and many will know someone who regularly carries one. However, many books for teens that cover these issues are much longer novels, and are probably not often read by the boys who need to read them the most, boys who are reluctant or struggling readers. The Gun, however, with its 65 pages and trademark Barrington Stoke large type and careful editing is perfect for boys like these, especially with its recommended Reading Age of 8 and Interest Age of 14+. Yet again, Bali Rai shows in this book that he really knows what makes young people tick, he understands how their relationships work and also the language they use. My thanks go to Barrington Stoke for sending me a copy. A couple of weeks ago I posted the first trailer for Anthony Horowitz's final Alex Rider book, Scorpia Rising. Trailer number two has been around for a good few days now but the past week or so has been stupidly busy at school so apologies for the delay in bringing this to your attention. Only eleven days to go until its release! 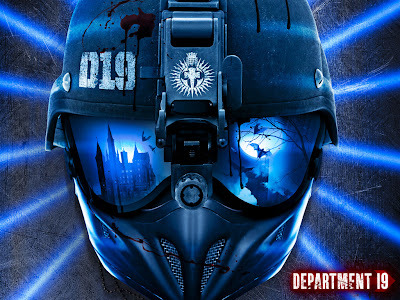 A Case For Department 19? Girl FALLS from sky and survives?! Since I started The Book Zone I have been invited to a number of events, but as a teacher I have not been able to attend many of them as they were either too early in the day (teachers can't take time off work), or they clashed with a parents' evening at school. A quick glance at my calendar brought an ecstatic whoop and a simultaneous sigh of relief - I was free, and come what may I was going to be there on the night! Thanks to the fantastic directions sent to me by Geraldine Stroud, publicity director at HC, I managed to navigate myself out of the maze that is Hammersmith and up the road to the impressive HarperCollins building where I was warmly welcomed by a smiling team from HC, and also the lovely Mary Byrne, a leading figure in children's books PR in the UK, working with the likes of Darren Shan, Derek Landy and now Will Hill. I was taken straight up to the fourth floor media room where a much needed cold beer somehow found itself in my hand. I recognised a few faces (mainly from their Twitter photos), and very soon found myself chatting with Darren who runs the brilliant Bart's Bookshelf, and then Jenny from Wondrous Reads, both people I have been conversing with over Twitter for many months. And then Will Hill arrived. Not with some great fanfare of trumpets, or with Carl Orff's O Furtuna from Carmina Burana piped through hidden speakers (although given the content of Department 19 this would, I feel, have been wholly appropriate) - no, he just casually walked in, accompanied by the legend that is Nick Lake, editorial director at HC and also author of the brilliant Blood Ninja (and I mentally kicked myself for not having brought my copy along for him to sign). As soon as I felt it polite to do so I excused myself from the group I was chatting with and went over to introduce myself. I felt quite nervous as Mary Byrne had already told me that Will was really looking forward to meeting me - surely that should be the other way around?! However, I managed not to become all gushing or fanboy irritating during the next ten minutes before the presentation started; Will was charming, enthusiastic and just a really nice guy in general, although maybe I shouldn't say that given the blood-soaked content of Department 19. "...when I was 13 I had this image of a boy basically finding his dad being shot in the garden of his home". That image stayed with him for a long time, but ultimately became the central story of Department 19: "a boy whose father is killed for reasons that he has no real understanding of, who survives for two years very lonely and bullied and very unhappy, only to find himself attacked by a girl....and finds him mum attacked by something even worse. He is rescued by a creature from the annals of horror history who shouldn't really exist and finds himself drawn into a secret government department called Department 19, that had been operating for a long time in complete secrecy and had been dedicated to policing the supernatural and keeping the supernatural out of the public domain". Will went on to explain that the premise is that: "what happened in Dracula was a real account that Bram Stoker acquired from the people who were involved: Van Helsing, Holmwood, Seward and Jonathan Harker, and the idea is that in the aftermath of that they were tasked with forming a group that would defend the British Empire from the possibility of any further supernatural events". Will went on to explain that he was a big fan of horror when he was a boy, but there was little around for teenagers at that time, and he had progressed from Roald Dahl straight on to the likes of Stephen King and Clive Barker, and therefore in writing Department 19 he was filling that gap that his 13 year old self craved to be filled. Having then read Dracula and Frankenstein at the age of about 14 or 15 he was left with questions, particularly with Dracula, questions that have stuck with him for years, and now he has had the opportunity to answer in his own writing. He also wanted to reclaim the vampire from the sparkly brigade and make them scary again - and having read Department 19 I can happily confirm that he has done exactly that. Back over to Nick who somewhat gleefully proclaimed that Will suffers from borderline insanity, as he started to show us several print outs of family trees, access codes, etc that Will had created during the writing of Department 19, going into the minutest of details to create the ancestry of characters in the book, with more than half of these ancestors never having any form of mention in the story. Will then confessed that Nick didn't know the full truth - he had actually written half page biographies on every one of these people, the reason being that ultimately by doing this it creates a sense of belief in the reader as they are drawn into the world that he has created. Finally, before the audience were asked of they had any questions, Nick asked Will if he would give us a sneak preview of the second book in the series. Will explained that "is a bit like Empire Strikes Back, in that it starts to deliver on the some of the things that get hinted at in the first volume" and that it is "a lot darker.... the first book is a rescue mission, the second on is more a fight for survival". The questions from the audience were rather varied, the first of which was whether Will felt that the book jacket might alienate girls. He didn't think so, but teenage boys were the core demographic at which the book was aimed, but there was a hope that word would travel and girls would still pick it up and enjoy it. Nick then chipped in that in his opinion teenage boys had been not as well catered for as teenage girls in the last five years, and there was a feeling that they wanted to show boys that here was a book for them. Will also answered questions on how many books there would be in the series? (three, is the current plan, but this may change - he knows exactly how it will all end, but it may take longer to get there); Werewolves? (yes, and Haitian/voodoo style zombies, but no mummies); Any other post-D19 projects (yes, and if he had to do a Hollywood pitch it would be The Exorcist meets On The Road); and then he rounded off my explaining that the vampire girl Larissa character started off as a very minor character, but then she just grew and grew until she became a key character, and also the somewhat bizarre love interest for hero Jamie. To wrap up we ere then shown a short and scary promo video that will play a part in the marketing campaign - watch this space to see it coming very soon. After the presentation was over Will very kindly signed copies of the finished hardcover edition for everyone (this after having signed 1500 copies earlier in the day), and I also managed to get him to sign the proof copy that I received back in September. I had the chance to have brief chats with several other members of the HarperCollins team, where I was informed they were planning a Department 19 blog tour - again, watch this space for more news of this. My thanks go to Geraldine Stoud and Alison Ruane and their team for putting on a great event for us bloggers and librarians, to Nick Lake for his questioning, and of course to Will Hill for taking the time to talk to me about his work, and for signing my books. 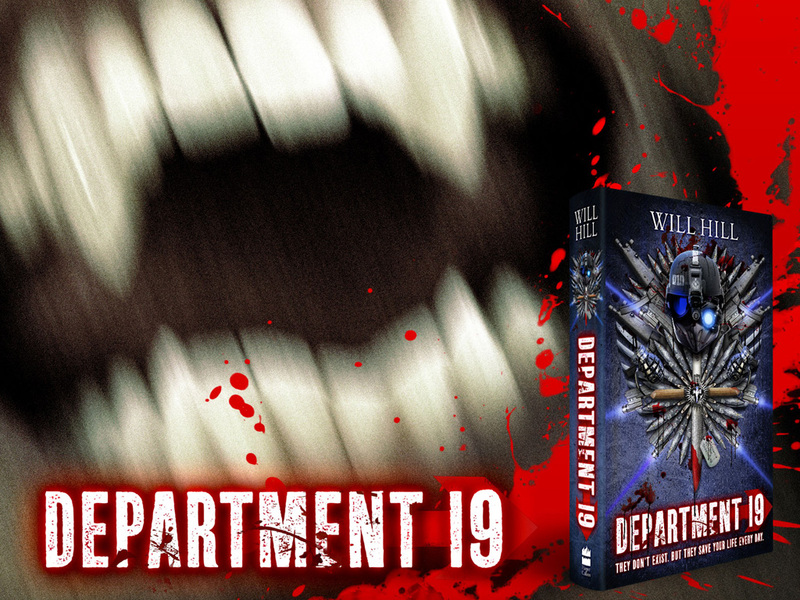 Department 19 is released on the 31st March and is perfect reading for action or horror loving boys aged 12+. 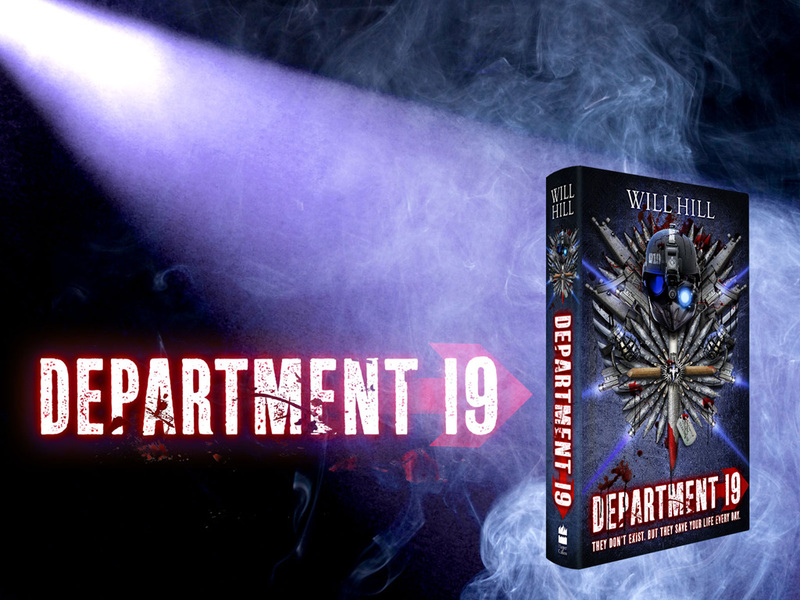 If you like some of the images from this post then head on over to http://www.department19exists.com/ where you can download them as wallpapers, see some great images of weapons from the story and read an extract book. 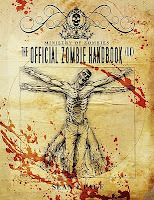 A couple of weeks ago I posted a review of Sean T. Page's Official Zombie Handbook (UK). Now, thanks to the generosity of the author I have a signed copy to give away to a reader of The Book Zone. In order to be in with a chance of winning a copy of this book all you have to do is fill in your details on the form below. The first name drawn at random after the closing date will win a copy of the book. Deadline for entries is 8pm Wednesday 23rd March. This contest is open to UK residents only. Let's face it.... zombies are cool right now and seem to have become the monster of choice for writers of teen fiction. However, just as there was something of an anti-vampire backlash a year or so ago, I am sure there will already be a number of people asking whether the world really needs another new YA zombie story. The answer is yes, and that book is Rot and Ruin by Jonathan Maberry. Mr Maberry is entering a difficult market in this country, as we are already two books into Charlie Higson's outstanding The Enemy zombie series, and therefore any newcomers to the genre will have to face the inevitable comparison with Higson's books. In the case of Rot and Ruin the comparison is very favourable indeed - where Higson's stories are blood-soaked, gore-filled post-apocalypse kids versus adults survival stories, Maberry's story is something completely different and brings a much welcome freshness to the genre. Somehow he has managed to create a zombie story with heart and soul, where the undead, and the obligatory gore and horror that come with them, are present but taking a back seat to the two main themes: developing relationship between two brothers; and the evils that man will commit in the name of survival and personal gain. In this author's world humans have to a degree conquered the zombie menace by creating settlements surrounded by protective fences, complete with guard patrols and observation towers. 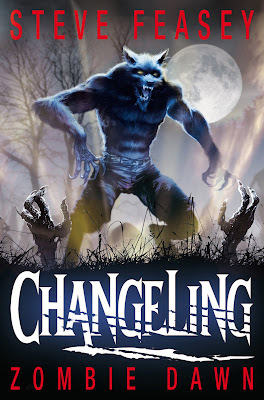 Fifteen year old Benny Imura lives with his brother Tom, a respected (and feared) zombie killer, in one such settlement. Beyond the safety of the fence is the Rot and Ruin, a vast area of zombie-infested wilderness within which are the occasional isolated communities of humans striving to live some kind of normal life. The brothers' parents died at the start of the problems, a time now referred to as First Night, and since then Tom has been working hard to bring up his younger brother. However, now that Benny has 'come of age' he has to find a job if he wants to continue to receive food rations, and the first part of the story gives the reader a humorous observation of Benny's various attempts to find a job that a) he likes and b) will not take too much effort, most of the time accompanied by his close friend Chong. These early chapters also help give us a valuable insight into what life is like the the people of Mountainside as they try to cope with their very different world, and we also get to meet the key characters of the story that follows once Benny reluctantly decides that following his brother into the zombie-hunting trade is probably his only real option after all. The scenes within Moutainside are the perfect foundations upon which the later story is built, as before Tom and Benny venture out into the Ruin as 'partners' we already know a great deal about them, although there is an air of mystery that follows the elder of the two brothers throughout most of the book. Important and enjoyable these early scenes are, it is when these two brothers are beyond the safety of the fence that this story really comes alive, but not just because of the horror and action scenes that ensue. Yes, these are very well written, and had my heart pounding at times, but in my mind they were still only secondary to the slowly growing bond between the two brothers, and the atrocities that other humans were committing out in the Rot and Ruin, often in the name of their own personal entertainment. We very quickly realise that the greatest danger facing the Imuras is not the bite of the undead, but the machinations of a group of their fellow humans, people so evil that at one point I actually felt sorry for some of the zombies - a first for me in a zombie story. 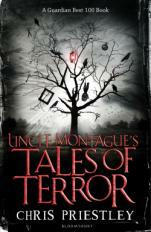 If you like zombie stories then this is a must buy for you. 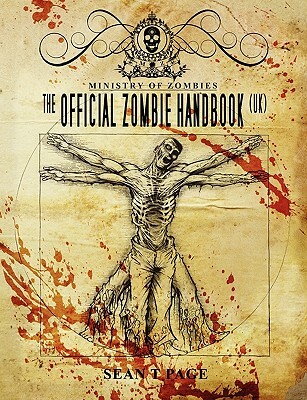 If you don't like zombie stories then this is still a must buy - yes it has some gory moments, and the occasional swear word, but it is much more than a horror story - it is a tale about two brothers working together to overcome a great evil, and a fantastic study in what makes us human in a world gone crazy. 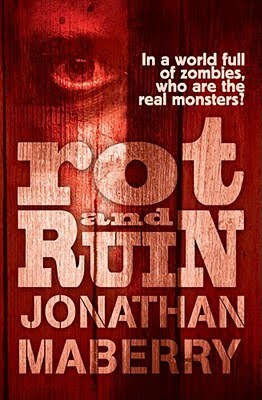 Rot and Ruin was published in the UK by Simon and Schuster at the beginning of March and my thanks go to them for sending me a copy to review. 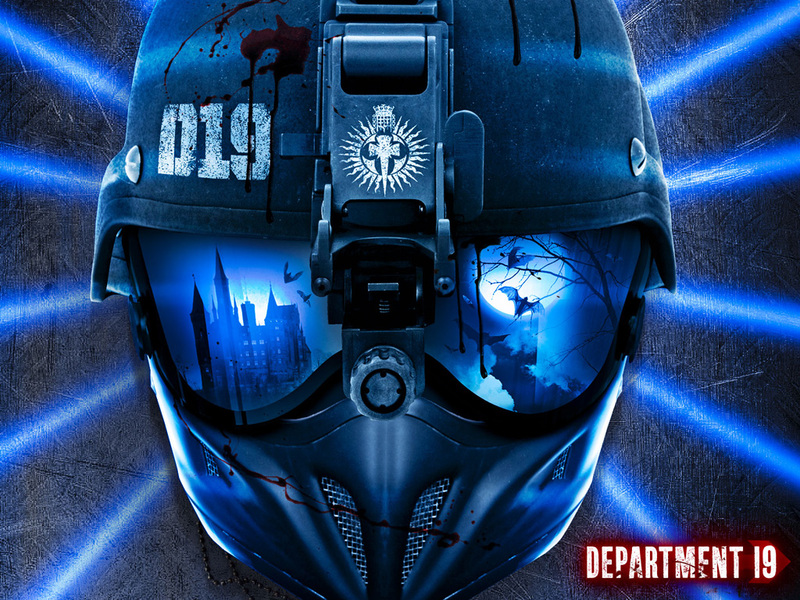 The sequel, Dust and Decay, is scheduled for a September 2011 release - I can't wait! Well done and thank you to all of you who entered. I will now endeavour to contact the winner through by email. Please reply within 48 hours or I will draw another name out of the hat. Many thanks to Bloomsbury Books for providing the prizes. Starting over is like pressing the reset button on a game that makes you lose all your points and wipes out any of the good stuff you've spent hundreds of hours learning...Surviving the year is all Milo has to do. Start to finish in one whole piece...But it's not just a new school he's dealing with; it's a new house, a new neighbourhood - a whole new life. And it's one without his mum in it. Every now and again a book comes along that literally takes my breath away; Department 19 by Will Hill was one of these back in September 2010, and now Milo and the Restart Button is the latest, but for very different reasons. This is not a book I would typically pick up in a book shop - the blurb does not mention explosions, car chases, death-defying exploits or sleep-preventing horror and there is no reluctant teen suddenly finding himself having to save the world from certain destruction. Instead, we are told that it is a story "brimming with heart, humour and hope", and it is exactly that. I loved this book, and my thanks go to the generous people at Simon and Schuster for sending me a copy, as I genuinely feel that my life is now that little bit richer for having read it. The book tells the story of Milo, a boy who has been dealt a devastating card in life with the death of his mother. Since then he has struggled to find any kind of stability in his life as he is moved from place to place, and school to school, by his father who is also struggling with the loss created by their bereavement. You might be thinking that this is a pretty challenging subject for a children's author to tackle, and yet author Alan Silberberg has produced a truly heartwarming story that has poignancy and humour in equal measures, and it deals with the topic of childhood bereavement in a way that no other book I have read has managed. Milo is a fairly typical 12 year old boy, albeit one with some seemingly strange quirks. He wants to fit in, just as every child does at this age, but he feels that there are many obstacles in his way, one of them being his name - Milo Cruickshank is almost the furthest away from being a cool name as you can get, and certainly does not make him a contender for membership in the Cool Name Club. One of the methods that Milo employs to get through life is his creation of the debonair Daubney St Clair, an alter ego that never gets tongue-tied, and is always cool, calm and collected and I guarantee that he will put a smile on the face of even the most cynical of readers. This books has simple cartoon drawings littered throughout, and so comparisons with the Diary of a Wimpy Kid will be unavoidable for some. Please do not buy this expecting something similar to Jeff Kinney's bestsellers - in those, the illustrations are an integral part of the story, whereas in Milo they are there for a different reason: they don't tell the story, they add to it. Sometimes this is purely for laughs, but at other times they help to lighten the mood following a particularly poignant moment. You may think this to be a risky task, as sometimes lightening a deep moment with a cartoon could trivialise it in some way, but this never happens in Milo - somehow Alan Silverberg has managed to place his cartoons at exactly the right moment in the narrative, almost like the 'timing' of a world class comedian. Milo's voice fits the story perfectly, and you very quickly find yourself sharing his hopes and fears, and you will probably also experience a rollercoaster ride of emotion as you progress through the story. This is definitely a must-read for 2011 and I hope it finds its way onto the shelves of school libraries throughout the country. There are a number of organisations that help children to deal with bereavement and this book could become another tool that could help them with what I can only imagine to be a difficult and often heartbreaking task. Edgy Taylor sees demons when nobody else can. Edgy thinks he is insane and expects to be carried off any minute. He is a prime collector, wandering the streets of London collecting dog muck for the tannery. The only thing Edgy is good at is setting and solving riddles, and evading his brutal and abusive master. One night, when his master seems genuinely intent on killing Edgy, Professor Envry Janus intervenes. Envry takes him to the Royal Society of Daemonology where Edgy will now live. It is here, though, that Edgy discovers chance had nothing to do with their meeting, and that he holds the key to a deadly demon prophecy. I have been looking forward to reading this book for pretty much the whole of the past year, ever since I first read Jon Mayhew's debut book, Mortlock. 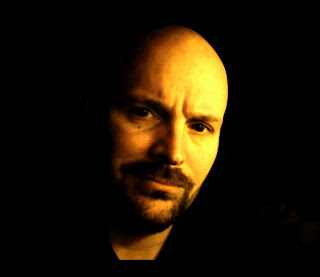 In April 2011 Jon did an interview for The Book Zone, in which he mentioned The Demon Collector, and also explained that he had a total of three books planned, all standalone novels set in the same Victorian time period. Since its release Mortlock has received many fantastic reviews and also made the shortlist for the Waterstones Children's Book Prize this year; all thoroughly deserved, but would the author be able to deliver a similarly brilliant follow-up? The answer to that question is simple: yes! Jon Mayhew is most definitely not a one hit wonder or one trick pony; he has a real talent for writing thrilling stories, with more than a hint of the supernatural. 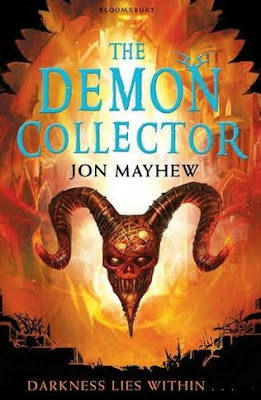 As he explained last year, The Demon Collector is set in the same time period as Mortlock, but with a brand new set of characters (although an observant reader will spot the occasional fleeting reference to characters that appeared in that first book). Yet again, we are treated to the author's atmospheric descriptions of the people and places of the time, with his writing really bringing the time period alive for the reader, but in a way that never seems unnecessarily wordy. The Demon Collector is lighter in tone than its predecessor. Mortlock was pretty gory in places and had many genuinely chilly moments, whereas The Demon Collector is more of an action adventure story with a form grounding in the world of the supernatural. Yes people die, lives are put in great peril, there are a small number of nasty scenes, and Satan and Moloch are hardly entities to be trifled with, but there is also a rich vein of macabre humour running through the whole story, much of it revolving around the various demons that Mayhew has created. We are led to believe that demons can be good or bad, but sometimes the line between the two can be very fine and easily crossed, providing many twists and turns as the story progresses. Another great feature of Jon Mayhew's demons is their love of riddles. In fact, no demon can resist a good riddle, and with Edgy being something of an expert in this area, we are treated to a number of really entertaining scenes where he verbally 'does battle' with a number of these demonic creatures. The motivations of the various adults that Edgy comes across are also not always as clean cut as we first think, and the author keeps us guessing right up until the final climactic scenes. I would like to say that the various demons are the real stars of this piece, but that would be doing a disservice to the plot, the descriptive writing of the settings, and the various human characters and their machinations. This really is a book that should be viewed as a complete package, and what a package it is! I'm now going to spend the next year waiting for Jon's third book. The Demon Collector was released yesterday, and my thanks go to Bloomsbury for sending me a copy to review. If you are a fan of Jon Mayhew's writing then I also strongly recommend that visit the Mortlock website as the author is gradually adding a number of short stories set in his dark Victorian world. Not long to go now Alex Rider fans. Scorpia Rising is published on 31st March, and believe me it is worth the wait. My review will appear on release day, but in the meantime here is the awesome trailer for the book. I bet you're even more excited now! Deep in the desert, Gorillas trade the oil under their city for bananas grown by hi-tech Robots. But after Gadget the Great accidentally sends 10,000 volts of electricity up King Well-Hairy's nose, the robots and gorillas decide to sort things out once and for all: whoever wins will have all the oil and all the bananas. Which side will manage to avoid the garlic burp-breath sand slugs? Who will be deceived by the banana sundae mirages? And when will they realise that they forgot to agree on a finishing line? I read a huge amount as a child, but I had friends who didn't. I have had conversations with them as adults, and looking back they feel that reading was too passive an activity for them. They couldn't sit still long enough to follow a story, and even on a wet day they would give up and go an do something else instead. A couple of them state that they can remember the moment books started to become more interesting, and it was when they first discovered Steve Jackson and Ian Livingstone's Warlock of Firetop Mountain, the first book in their long-running and phenomenally successful Fighting Fantasy series. Even though these friends were sport mad, and would treat anyone who played Dungeons and Dragons with disdain, this create your own adventure story, and all those that followed, struck a chord with them and all of a sudden they were reading books during school break times, swapping them one they had been completed. These books made reading a fun pastime for them and many of them are still avid readers today thanks to these books. 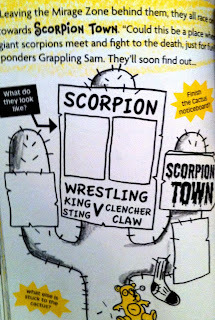 There are many, many choose your own adventure books around these days (including the oft re-published Fighting Fantasy series), but now author/illustrators Nikalas Catlow and Tim Wesson, in conjunction with Nosy Crow, a relatively new independent publisher of children's books, have come up with a great new concept that makes reading even more interactive for the 6+ age group. They have recognised that children love activity books, and whilst many boys may be reluctant to pick up a book and read they are often more than happy to sit doodling for hours, often with very comedic results. Why not, then, produce a book that tells a story, include crazy and hilarious illustrations, but also leave spaces for the reader to fill in further illustrations using their own imaginations? But the cleverness doesn't stop there. Nosy Crow did a survey, asking boys in this age group what they really liked, the results of which can be found here, and they they used this list in the creation of the Mega Mash-Up books. And so we have titles like: Robots v Gorillas in the Desert, and Romans v Dinosaurs on Mars (both published last month), and coming up in June, Pirates Ancient Egyptians in a Haunted Museum, and Aliens v Mad Scientists Under the Ocean. Pure genius! 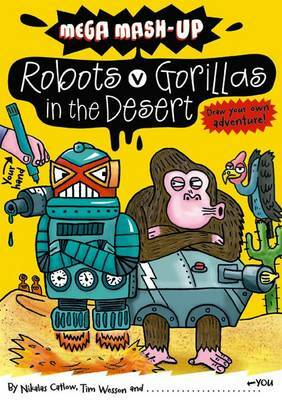 I have a copy of Robots v Gorillas in the Desert in front of me at the moment, and it is brilliant. 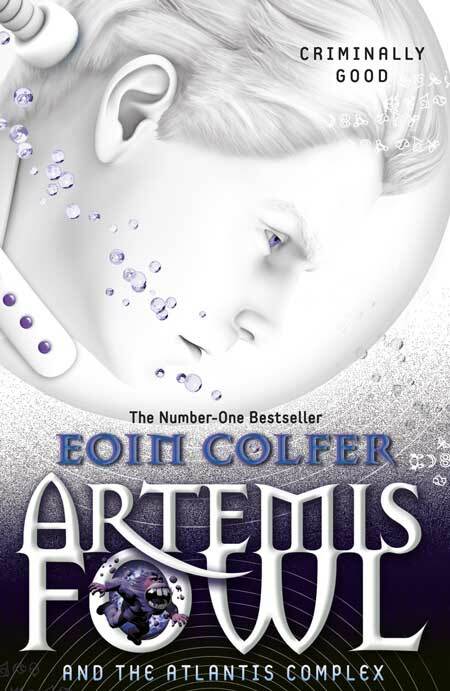 I can't believe there is a 6-9 year old boy out there who will not be enchanted by this book, and if they are as cool as this one the rest in the series as well. 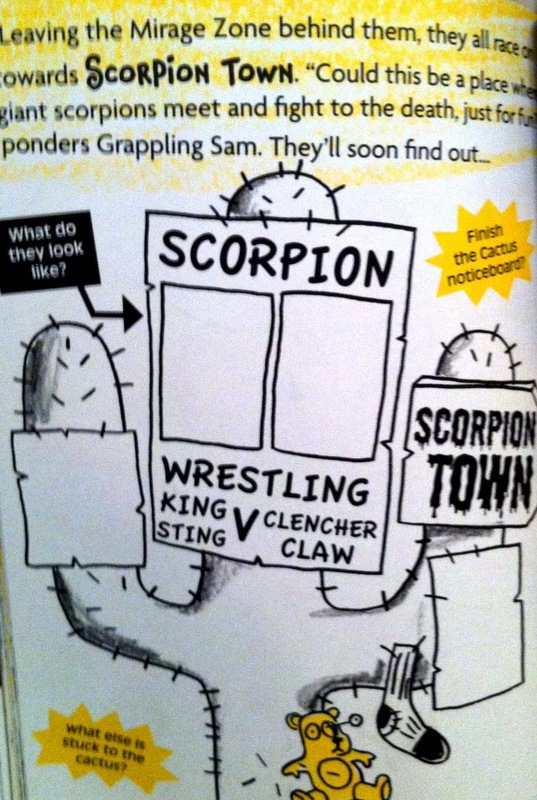 Marketed well and given the exposure they deserve, these books could become huge, with boys comparing their drawings and ideas in the playground, having competitions as to who can come up with the coolest doodles and additions to the story. If you are a parent of a boy in this age range you would be a fool not to get these for your son, and they should certainly become must-haves for those long holiday journeys and wet afternoons during school holidays. Nosy Crow also have a fantastic Mega Mash-Up website with all kinds of cool extra stuff, as well as a gallery where young readers can have their own doodles in the books showcased. My thanks go to the publishers for sending me a copy of the book to review. 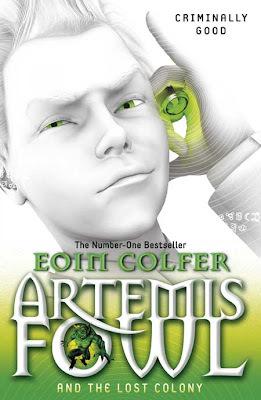 Today, Eoin Colfer, the author of the brilliant Artemis Fowl books, met up in Picadilly Circus with a group of young fans in order to unveil the new cover designs for his books on a giant electronic screen. 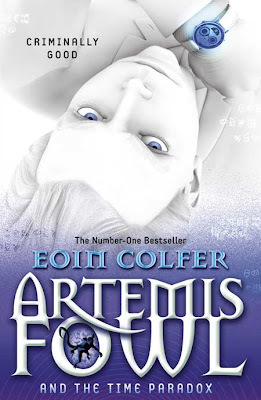 Mr Colfer has since blogged each of these covers and so I wanted to share them with readers of The Book Zone. 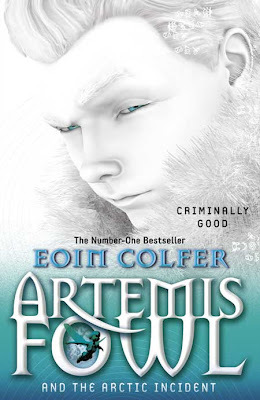 I have to admit that I do hate it when publishers rebrand books mid-series as from an aesthetic point of view I like my collection to be of a consistent design, and with one more book in the series promised I do wonder whether they could have waited until after its publication. However, it is ten years since the first book appeared on shelves across the country, and a celebration of this is most definitely merited. 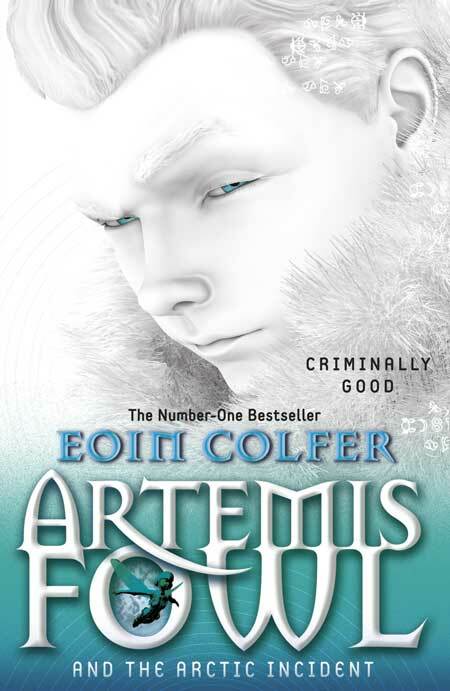 Oh yes, and if I am honest I do actually really like these new covers and I think they will look great as a set; they certainly depict Artemis as someone who you really would not like to get on the wrong side of. What do you think? Last night I had the good fortune finally to meet one of my writing heroes, Anthony Horowitz. 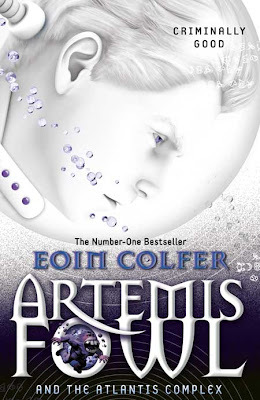 I have been reading this man's books for more than ten years, and in my opinion his Alex Rider books have had more influence on encouraging boys to read for pleasure than any other series in recent times. And yes, even more than the Harry Potter books. I know that is a pretty big claim to make, and I also know that many will disagree with me, but please hear me out. I will not deny that the Harry Potter books kick-started what is now referred to by many as the Golden Age of Children's Literature, and encouraged many children to pick up a book possibly for the first time. I am also happy to concede that many boys will be included in these numbers. However, I still feel that more boys in the UK will have felt the impact of the tidal wave of boy-friendly stories that followed the release of Stormbreaker in 2000. Without Stormbreaker would we have have had Muchamore's CHERUB? Joe Craig's Jimmy Coates? Charlie Higson's Young Bond? The list could go on and on, and every one of them would be a great boy-friendly series that may not have been born had it not been for the groundwork laid by Anthony Horowitz. Thus, when I saw mention some time ago that Mr Horowitz would be delivering a lecture entitled Literacy: State of the Nation for the National Literacy Trust I immediately rattled off an email expressing my interest in attending, and last night I ventured into London, feeling just a little bit nervous as I knew this even would be a little 'posher' than the usual book events I have attended over the past year or so. Fortunately I had my friend Liz De Jager (of the My Favourite Books blog) for moral support, and thanks in no small part to Liz I even got the chance to have a brief talk with the man himself. Liz is far more brazen with me when it comes to approaching authors, although in this case she was aided by the fact that she had previously met Justin Somper, a man who has worked very closely with Anthony over the years, and was also in attendance. Within seconds there was I telling my hero how great I thought his latest book, Scorpia Rising, was and that I had only just finished reading it on the train into London. Incredibly, Mr Horowitz seemed very relieved that a fan had enjoyed it, and he explained that he was a little nervous about its forthcoming release, it being the very final book in the Alex Rider series, and a story that at times was quite emotional for him to write. I can't say any more about the book as there is a worldwide embargo placed on it, but my review will appear here on The Book Zone on its 31 March release date. "What we need here is the the eloquence of Philip Pullman, the passion of Michael Morpurgo, the anger of Anne Fine, the wisdom of Malorie Blackman. And you get me. On the plus side, books have been my life. I remember when I was six years old my mother telling me that books are good for you that books are important...so you can imagine how conflicted I was when she was run over by a mobile library." He went on to discuss some of the key issues threatening the future literacy of our nation's children, explained his opinions of strategies such as World Book Night, and even managed to get a few humorous digs in at the expense of Dan Brown. I will not go into any more detail about his lecture, but if you are interested you can read the full transcript by following this link to the National Literacy Trust website. Whilst you are there please look around the site - the NLT is a charity that does some fantastic work and now that their funding has been cut they need public support in raising the funds needed for this work to continue in the future. After his lecture Mr Horowitz very kindly signed my copy of Scorpia Rising, and it gave me the chance to tell him to get moving on the next Power of Five book. He replied that he was going to be working on it this month, although I do not have any release date information. I left the building more than a little star-struck. I feel I should use this forum to again express my thanks to Mr Horowitz for his time, and to Justin Somper for his introductions. Unfortunately, I did not get the chance to talk to Justin other than that initial quick hello, but I hope to remedy this some time in the future. 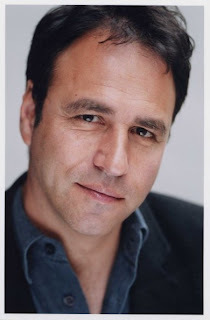 If you ever get the chance to listen to Anthony Horowitz talk, do it. Don't hesitate to wonder whether you are free, just say yes and then cancel anything else you might have already had booked in. You won't regret it.